Shimano Deore M6000 Mountain Bike Groupset Finally! I'm always happy to see the budget components getting pro design. The new Shimano Tiagra 4700 and Sora R3000 was the case. Now it's time for affordable Mountain Bikes to get to the next level! 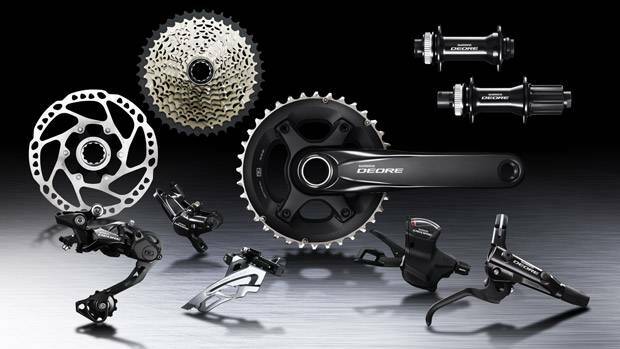 If the new Deore M6000 generation won't get much more expensive, that the current one, it will be a great news for many riders, as Shimano claims, that the new stuff can even be used for All Mountain! No! It's not XT, it is the Four-arm design Deore crankset. Tripple cranks for advanced trail riders. Great, improved Shimano Shadow RD+ system. More stability on rough trails. Clamp-on shifter with Optical Gear Display. That's right - the I-Spec mount version! 10 speed cassette on spider and MANY gearing options. Directional chain now also for budget bikes. Shimano claim great stopping power on Deore brakes. Center Lock or six bolts version disc rotors. 160, 180, 203 mm. Ice Technology and better heat insulation. There is mainly just one thing, that Deore M6000 groupset won't get yet and it is the 1x11 drivetrain, meaning no single chainring in the front and no 11 speed cassette. The options of 2x10 and 3x10 systems will fit most of the Mountain Biking enthusiasts! All the components should be available in May 2017 or on the 2018 bike models.